Lethbridge College is blazing a path and carving out a significant history of pioneering work in the fields of Virtual Reality and 360-degree video. Currently leading the charge in 360-degree and virtual reality is The Digital Communications and Media program. Digital Journalism students have been immersed in the new, active and collaborative storytelling mindset that comes with the emerging mediums that may soon occupy the newsrooms of the future. VR and 360 video is opening doors for aspiring journalists and exploring how those new avenues are being consumed by the general public, and the work being piloted at Lethbridge College is leading that revolution. Print is not dead. In fact, there is plenty we can do to grow, save and improve print now. 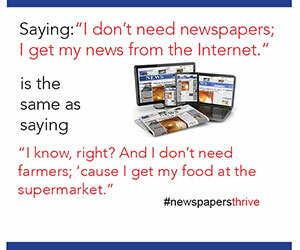 And newspapers would be crazy not to invest in print, the source of much of their digital content, subscriber commitments and advertising revenue. We’ve heard we should be digital first, video first, mobile first and more. But newspapers end up chasing their tail and getting no where. None of those are strategies. This session will help you learn how to get your team organized and thinking outside the box to take a fresh, common sense look at all the future potential of print and all your content platforms. Bill Ostendorf is quite the contrarian. In fact, he often advises clients to do the OPPOSITE of whatever newspapers are doing. "The newspaper industry, under heavy deadline and financial pressure, is notorious for jumping on bandwagons, whether it's new ad ideas, Twitter, Google or Facebook," he says. "Trouble is they often jump as soon as they see others jumping and don't think it through." As a result, newspapers have blown numerous opportunities for success by folding TV books, abandoning food coverage and feeding Google and Facebook all their content. Small papers also copy what big papers do, which is another good way to fail. And big papers ignore the success of small papers. It's crazy and we've got to stop! Too many print ads are simply a waste of money. That's not because print advertising isn't effective. In most cases, print ads work better than almost any ad form. The problem is that the ads themselves are poorly written and designed. In short, they stink. We'll show dozens of failed ads and how to fix them – simple rules and ideas you can apply to your operations immediately. The difference in the before and after ads is dramatic and will get you pumped up and ready to go home and fix one of our industry's biggest and least talked about problems. Bill Ostendorf, president of Creative Circle Media Solutions, has helped redesign more than 650 print publications and 350 web sites. He has served as strategic consultant to hundreds of media companies on three continents. A popular speaker at industry seminars, he has led more than 1,000 workshops in 23 countries on a wide range of topics. Originally trained as a reporter at Northwestern’s Medill School of Journalism, where he earned both a BSJ and MSJ, he started his reporting career working in the Chicago suburbs for The Chicago Tribune and Paddock Publications. Bill spent 13 years at The Providence Journal, where he served as managing editor for visuals and new product development. Previously, he worked as an editor for The (Cleveland) Plain Dealer, the Ogden (Utah) Standard-Examiner and The (Twin Falls, Idaho) Times-News. He left his newsroom job in 2000 to focus on Creative Circle full time. Frustrated with the poor software available to his consulting clients, Bill started a software firm dedicated to improving newspaper web sites in 2004. Creative Circle now hosts dozens of successful newspaper, niche, classified and business sites and built the industry's first user-contributed, pay wall, hyper-local and native content platforms. Like many other Lethbridge College students, Savage, didn’t know what career she wanted to pursue, until exploring various professions after graduating high school. Pursuing the Digital Communications and Media program was a natural fit for her adventurous spirit and her desire to embrace new learning experiences. Last summer she was awarded an internship with Corus Entertainment. The internship offered a unique opportunity to get an in-depth experience in major market newsrooms. She spent time with teams at Globalnews.ca, Global Toronto, News-Talk Radio AM640, and Global National’s parliament bureau in Ottawa. That experience provided her with invaluable skills and knowledge in print, online, video and radio journalism. Her work with Lethbridge College’s applied research study has set her apart from the students around her and she joins the industry with a set of unique qualifications and the ability to adapt to the ever-changing industry and even spearhead that change. Dan Carroll is a trial lawyer with nearly 40 years of experience representing individuals and small, mid-sized and Fortune 500 companies in complex civil litigation matters before trial and appellate courts. He has served as lead counsel in a broad range of litigation over the years, including personal injury, subrogated insurance, commercial disputes, Residential School abuse, construction, media and internet defamation, bankruptcy and insolvency, municipal tax appeals and legal malpractice defence. Dan is also frequently called upon by clients and other lawyers to provide an in-depth case analysis to ensure an effective strategy is in place before it proceeds. Scott Matheson is a business-minded lawyer with a general litigation and insurance practice, representing clients including governmental and institutional entities in commercial and other disputes in Alberta and Western Canada. Professional liability defence, Policing, and Defamation claims.